What do you do when you have a lot of wealth? You eat it, LITERALLY! People from Dubai surely love their bling. And not just in their attire, but also in their food. One such splendid example of this is the Golden Phoenix Cupcake. This dish is dusted, doused, and dressed in 23 Carat pure gold. The Premium Amedei Porcelena Italian cocoa, the high-quality vanilla beans from Uganda, Doves organic flour from the United Kingdom, Rachel’s organic butter, and strawberries dipped in edible liquid gold add to the glory of the dish. What is most astonishing is the price label that the Golden Phoenix Cupcake comes along with when you order it. Hold your breath as we reveal the price! Okay, so the dish cost a bomb and is priced at whopping 3,676 Dirham or $1,010! As they say, masterpieces cannot be made in a jiffy, and need a lot of finesse with hours and hours of turmoil. Hence, the order for this dish needs to be placed 48 hours in advance at Bloomsbury’s in Dubai Mall. Shafeena Yusuff Ali, the founder of Bloomsbury’s Cupcakes, created this dish with the intention of redefining cupcakes in the Gulf. She said; and I quote: “Our aim is to redefine cupcakes in the Gulf, why can’t a cupcake taste as good as it looks and look as good as it tastes”. 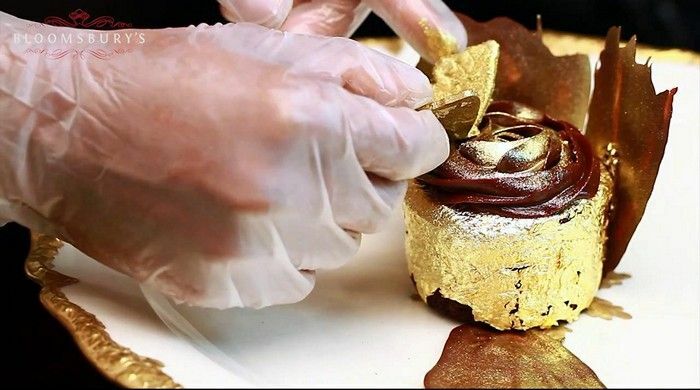 Like every artist in history, this epic Golden Phoenix Cupcake received a lot of criticism. Some called it completely pointless and unworthy. Whether you find Golden Phoenix cupcake appealing or not, it certainly has made its place on every cupcake enthusiasts wish list.